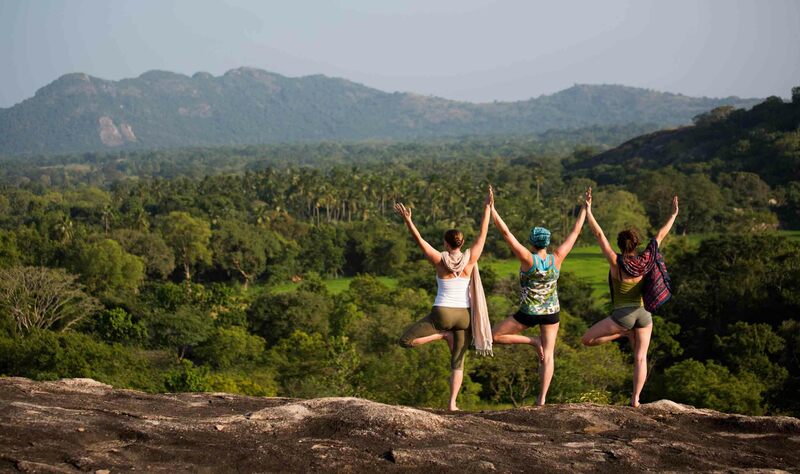 Ulpotha, located in the dry zone of central Sri Lanka, is the site of an holistic environmental and cultural undertaking by the East Pole Foundation, a non-profit organisation with a remarkable vision. Over the past four years Mudiyanse Tennekoon, Viren Perera and Giles Scott, the founders of the East Pole Foundation, have been helping a small village transform itself from an abandoned coconut plantation into a vital bio-diverse agricultural village. Their approach has been to draw significantly from tradition, while not abandoning the modern, to recreate an environment where nature and man live in productive harmony. Trees – over 4,000 of them – have been planted, ancient irrigation systems have been rehabilitated and traditional organic farming practices have been re-employed. What strikes you when you first arrive in Ulpotha is the physical beauty of the place as well as its extraordinary tranquillity. Located at the foot of the Galgiriyawa mountains, a forested range that captures precipitation from both the south-west and north-east monsoons, Ulpotha enjoys a temperate climate unusual for the dry zone. There is an arrangement of tanks, typical of the ancient irrigation systems of the country. They include a mountain tank for providing water for chena (jungle) cultivation, a forest tank for providing drinking water to wild animals in the jungle, an erosion/silt control tank, and a main storage tank for the irrigation of crops. These four tanks all store water from the catchment area for the lands throughout the watershed Ulpotha is at the head of. About twenty five years ago, the government’s Department of Irrigation, in what proved to be an ill-advised attempt to increase the water storage capacity, joined the forest, erosion control and storage tanks by breaching the bunds that separated them, dynamited the natural rock spill and constructed a concrete weir and sluice gate. This resulted in a significant decrease in the amount of water available for irrigation – to the extent that only one harvest per year was possible – due to silting, a lowering in the level of the local water table, and leaks in the poorly constructed weir. The rehabilitation of this system of tanks has been one of the main service projects undertaken by the East Pole Foundation. In the first phase the bund of the erosion control tank was rebuilt and in the second phase the main bund was strengthened, the storage tank was de-silted and the weir modified and repaired. The third and final stage, which will be carried out in April, 1999, will restore the bund separating the forest and storage tanks. One of the longer-term goals of the East Pole Foundation is to promote organic farming throughout the watershed served by the tanks’ waters. Instead of preaching the evils of dependency on chemical pesticides and fertilisers, their approach will be to address the financial realities faced by the farmers. For the years until their crops can be certified as being organic, the Foundation will ensure that the farmers make no less than they would usually make in terms of profit by guaranteeing a higher-than-market price for their reduced harvest of rice. In effect underwriting the cost of the transition to organic farming. Once certification is possible, the Foundation will purchase all the organic rice harvested – at prices expected to be significantly higher than the local market prices the farmers receive currently – and sell it to wholesalers in western organic produce markets otherwise inaccessible to the local farmers. Ulpotha itself is already a self-sufficient mixed organic farm. The aridness of the land caused by years of use as a mono-culture coconut plantation has been effectively reversed by bio-diverse planting and the building of bunds. Both enhance the soil’s water retention capacity while the latter controls erosion and protects the soil’s fertility. Mature coconut , mango, jak and breadfruit trees have been complemented by banana, papaya, avocado, woodapple, green orange, lime, rambutan and other fruit trees. Indigenous, rare red rices – of varieties long since supplanted by fertiliser-dependant hybrid rices elsewhere in the country – are also grown in Ulpotha’s paddy fields. A wide variety of vegetables, melons and yams are also cultivated. Timber trees, such as mahogany and halmilla, along with ereka nut trees, have been planted to produce income in the future. The crops are protected from pests using traditional biological methods that include various applications of cactus milk, crushed neem seeds, dried makra leaves, branches of the kadura tree, jak fruit sap and crushed coconut refuse. Equally important are rituals where crop planting is initiated at auspicious times and milk is ritually boiled. The dwellings at Ulpotha, with the exception of the main house, are all constructed using traditional wattle and daub and have cadjan, (woven palm leaf) roofs. They are comfortable and perfect for the climate. The central waluwwa, or traditional manor house, is constructed mainly of sun-dried mud brick with the mortar used being a specific tank-bed mud.